A plan for a new, improved catheter designed to stop costly — and deadly — infections at the source is the winner of this year’s $10,000 Y-Prize, awarded Jan. 28 to four Penn undergraduates. The team beat out three other finalistsat the event. 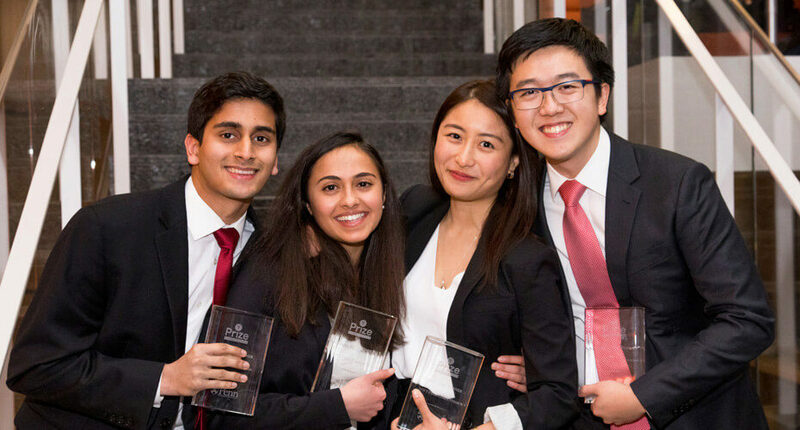 The students are Tanvi Kapur and Beatriz Go, both seniors at the Wharton School, and junior Ishir Seth and senior WenTao Zhang, in the Roy and Diana Vagelos Program in Life Science Management, a dual-degree program through the Wharton School and the College of Arts & Sciences. Their company, Nosoco Technologies, gets the money and is also entered into the semi-final round of the Penn Startup Challenge later this year if the project meets that competition’s guidelines. The Nosoco team, which came together at a table outside Wharton’s Huntsman Hall, had a personal reason for tackling the catheter problem, Kapur says: Zhang’s grandfather died from complications of a catheter-related infection. “This is a huge problem in hospitals,” she says. The Y-Prize is a collaboration between Penn Engineering, the Mack Institute, Penn Wharton Entrepreneurship, and the Penn Center for Innovation. Applicants submit a video pitch explaining their idea, why it’s needed, and how they plan to make it happen. Contestants had a choice this year between two Penn-grown technologies: roll-to-roll surface wrinkle printing and embodied logic. All four finalists chose the printing technology, which was invented by School of Engineering and Applied Science professors Daeyeon Lee and Kathleen Stebe, of the Department of Chemical and Biomolecular Engineering, Shu Yang, of the Department of Materials Science and Engineering, and Xu Zhang, a postdoc who works with them. Read the full story at Penn Today.